What Materials Do I Need in Order to Run a Campaign with Cool Tabs? Running a campaign or a competition with Cool Tabs should be a very fast and simple process, which shouldn’t take more than a few minutes. However, if we want this to be that simple, it’s important that we prepare in advance all the materials we may need to get our competition set up. Depending on the type of campaign or competition we have chosen, we will need some specific customised designs and contents. Key Content Needed to Run a Campaign. 1.1. 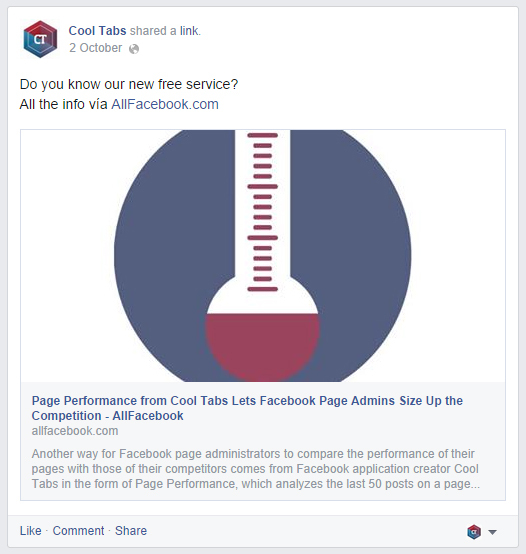 Tab name to be displayed on Facebook. This option is only mandatory for the competitions which are to be posted on Facebook. The name or short text we include here will be linked to our Facebook application and it’s usually the campaign name or title. 1.2. Campaign name or title. If you have already decided what format you want to use in your campaign and what you are going to give to participants as a reward for their participation, you just need to put this into a few words, and that would be the title of your campaign. Come up with something original and able to attract the users you were targeting when you designed the campaign. The title can already reveal the objectives of the campaign: “Get a 50% off voucher“, or else, be a bit more attractive and arouse people’s curiosity: “Will you be the chosen one for the curse of the scorpion?”. This text will be displayed under the campaign title and should briefly but clearly explain what the competition is about and how people can participate. You can change the font and size of your text and edit font styles (bold, italics, etc), include pictures, etc., to encourage visitors to become participants. You can also include your own html code, which can be very useful to fully customise your campaign or, for example, upload a video from Youtube or Vimeo. 1.4. Text to be shown after user participation. Once participation is complete, a message will be displayed for users. You can customise this message to make it your own thank you note, and include pictures and videos. You can use this section to inform participants, in case there is something else they need to do once they have completed their participation. You can also take this opportunity to remind users what steps they need to follow to have a chance to win the competition. As it so happens with the description field, this field also allows you to include your own html code to be able to fully customise this section. The terms and conditions of your competition are not a mandatory field of the competition settings. However, we strongly advise you to incorporate them, as the default settings will only include the General Terms and Conditions as Service Providers. In the competition’s terms and conditions you can explain how the competition works step by step, what criteria are going to be used to select the winner, and what kinds of actions can disqualify them from the contest, among other things. It is also important to provide users with information on how their personal details will be used. Don’t forget that the campaign administrator/s will be the one who manages user participation and selects the winner or winners through Cool Tabs, since our applications allow him/her to do so. However, our platform doesn’t take responsibility for this, so it would be advisable to inform of this in the terms and conditions of your competition. Here you will find a template for you to draft your own terms and conditions (ES). Pictures are a major player in your campaign. They enable you to create a campaign with more personality and originality. The best thing to do is to prepare these graphic materials before you start to fill in the form that enables you to create a new campaign or competition. 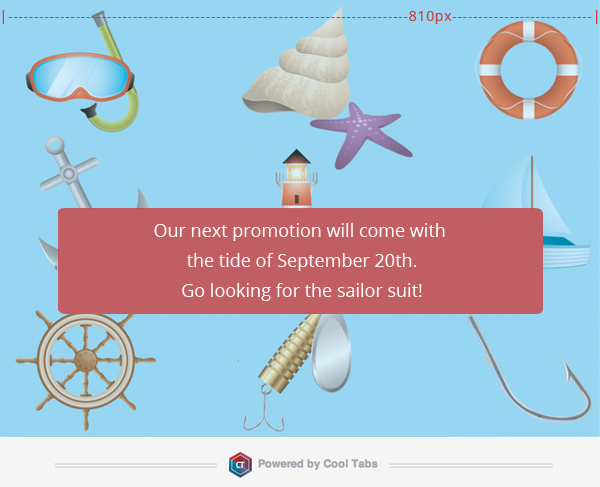 Cool Tabs supports the following image formats: .jpg, .gif, and .png. The maximum file size for any image that is uploaded to the campaign is 1MB. All our applications can resize any images that you want to use throughout the campaign. However, if you take the final size of the image into account when designing it, the results will be better, as the image won’t lose its quality. This is the star of your campaign, as it’s the first thing users see on the landing page of the campaign. The main picture of the campaign performs two distinct functions: To let users know what is the theme of the campaign or competition, and to provide them with relevant information about it. Often, it also describes the procedure users need to follow in order to participate in the competition. 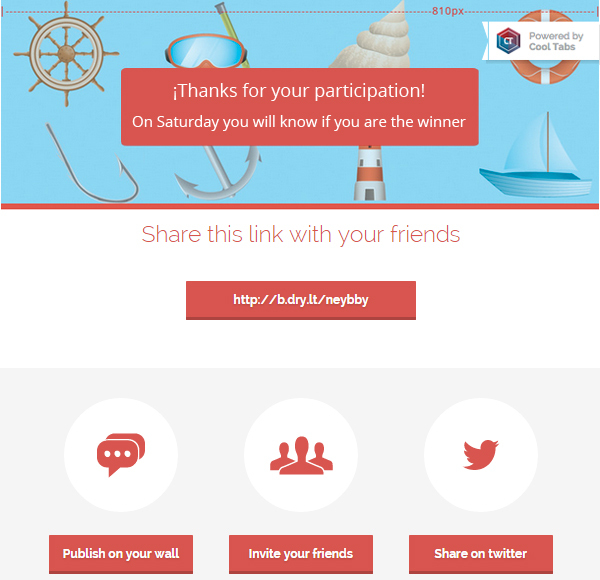 Then, further details on how to participate are included in the description section of the campaign. Size: 810px wide and unlimited height. 2.2. Picture to be shown after user participation. This will be the last image to be displayed and it will appear after user participation is complete. It is normally used to thank users for their participations and to provide them with some useful information (such as when and where the names of the winners are going to be announced), recommend actions to get more votes, to score more points, etc. You can also use this section to offer discount vouchers. 2.3. Picture to be displayed when users share the campaign on Facebook. This picture will appear when a user or fan page shares the link to the campaign or contest, or to his/her participation. This picture will include a title and a description that you can also customise in the “additional details” section of your campaign's settings. If no image is uploaded in this section, the campaign's main picture will be displayed by default. 3.1. Picture to be displayed at the top of the participation form. This picture will appear on the top of the form, as a banner, taking up the full width of the page. 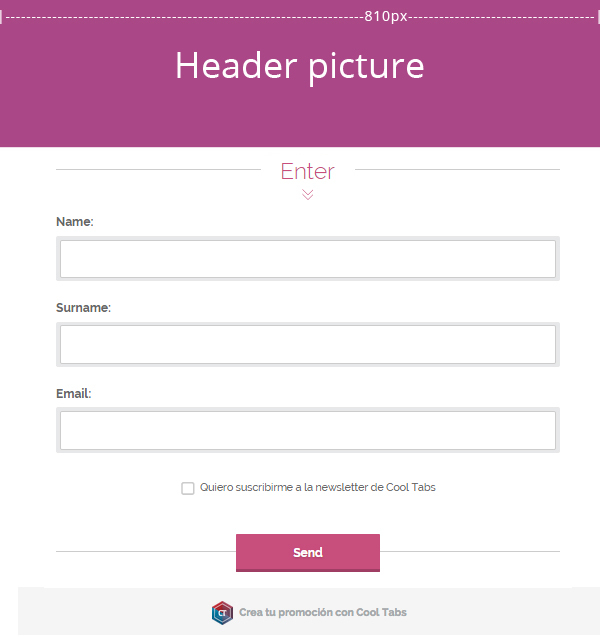 If you want to include a picture on the heading of the form, we recommend you use a picture that is not very high, so that the scroll bar of the page is not too long. 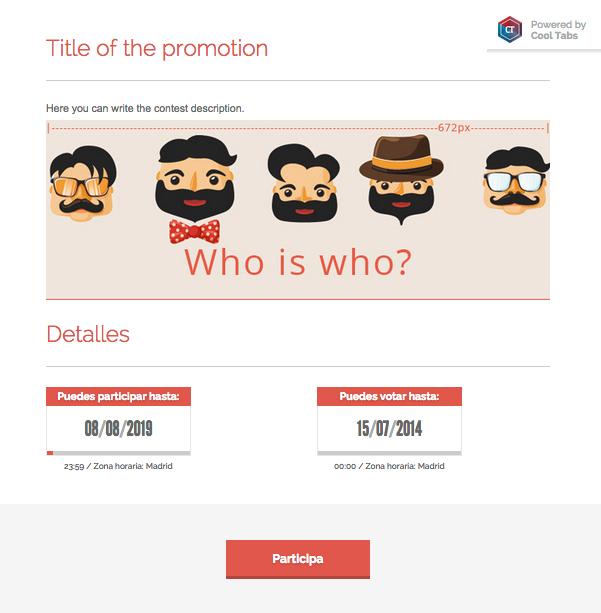 We can also use a particular header picture and, then, ask questions about it on the participation form, or else, use this space to upload some text or video for it to appear at the beginning of the form and provide users with useful information about the details they need to include on the form. 3.2. Picture to be displayed at the top of the entry form ("Personal Data" section). 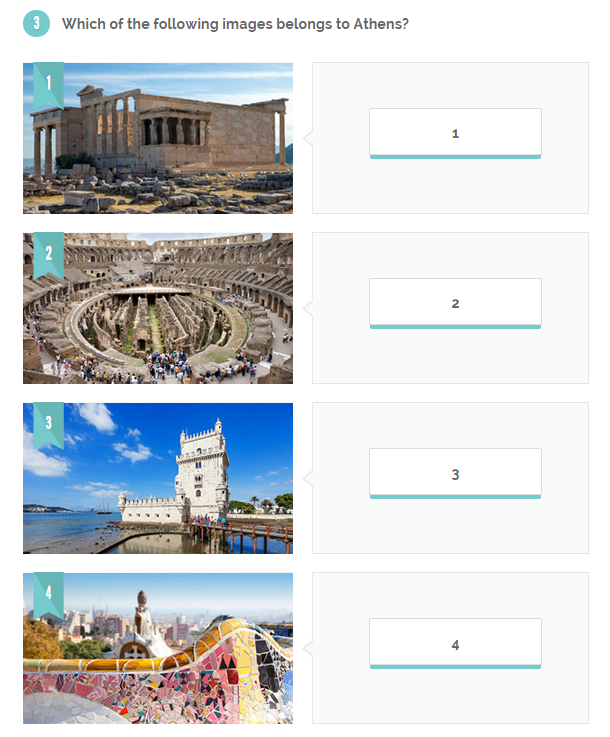 This picture will appear below the picture to be displayed at the top of the participation form and beyond the data form users need to fill out in order to participate in the competition. Use this space to upload some text, images or video for it to appear at the beginning of the form and provide users with useful information about the details they need to include. * Keep in mind that this option will only appear beyond the form data if this option is activated in the quizz. It won't be repeated again. Whether you decide to include it or not, the picture to be displayed at the top of the participation form will still appear at the top of the form as a banner. Our templates feature a white background that we personally love. 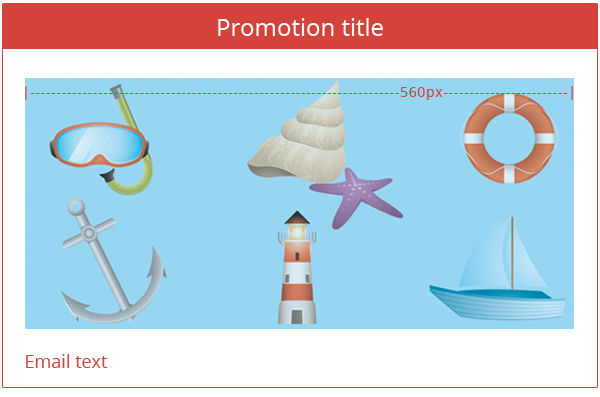 However, depending on the design of your campaign, you may want to customise the background image. In this case, you will need a picture which is 810px wide and whose height takes up the full length of your campaign page. 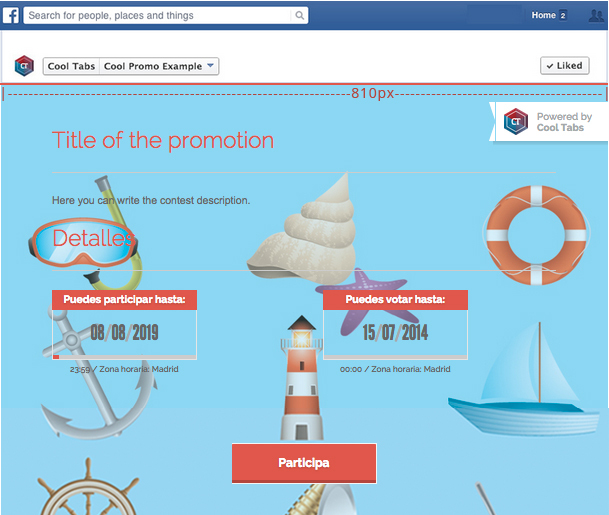 Don’t forget that the background image you select here will appear in all the pages of your campaign or contest. Size: 810px wide and unlimited height (the image can be smaller, in which case, you can select the option to horizontally or vertically repeat the picture, or in both directions). 3.4. Picture to be displayed on the description section of the competition. Besides including some text, you can also add a picture to the description section. These pictures can be uploaded through the editor option available in the ‘Campaign description’ section. Size: 672px wide and unlimited height. 3.4. Picture to be displayed before the campaign starts and picture to be shown when the campaign ends. It is possible to show different content to visitors before the campaign starts and once it has ended. This content, as it so happens with the main description of the campaign, is created with our html editor, which also enables you to upload pictures. This option can be very useful if we are planning to publish the application before the contest starts. Instead of showing the “there is no campaign available” message (which is the default message that is displayed before the campaign or competition starts), you can go for a different message, one that arouses user curiosity and informs them, for example, of the start date of the campaign. Moreover, a picture can also be useful once the competition has ended, as we can inform participants of future editions of the contest or the names of the winners with a special made-to-measure creativity. *If you want to show winners names using the automatic option available with Cool Tabs, you don’t need to enable the option to show a different design when the campaign ends. 3.5. Pictures for the customised questions and answers of the participation form. 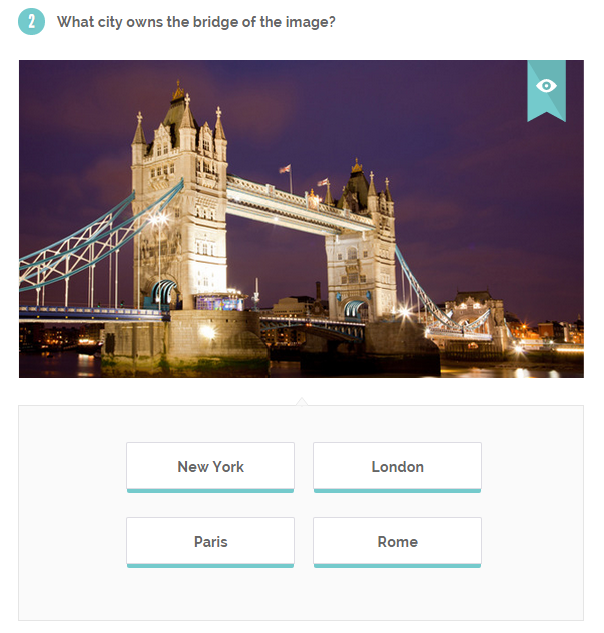 If the format of your competition is a quiz in which participants need to answer questions, you can include different images on the question or answer pages, so that the quiz looks more attractive to participants. These pictures can be added on the ‘Customised questions to be included in the form’ section. Size of the pictures for the customised questions: 628x353px. 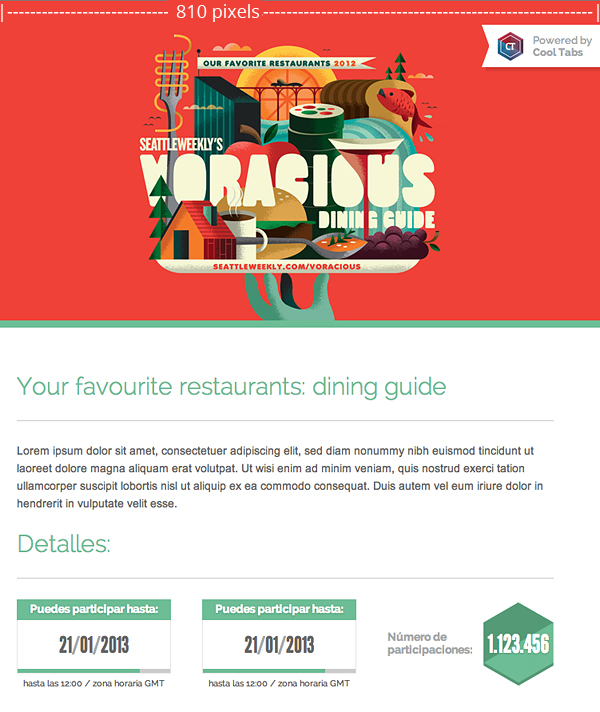 Size of the pictures for the customised answers: 300x168px. 3.6. Picture to be included in the email sent to users after participation. Sending an email to participants after their participation in your campaign or competition is a good way to strengthen your relationship with them. This email can include a short text to thank them for participating and let them know when the winners will be selected and/or how this selection will take place. You can also add a picture to this email so it’s more original. Size: We recommend 560px wide and unlimited height. 4. Materials to be used on white label applications only. 4.1. Icon for the application created with Facebook Developers. When you use our Cool Promo White Label and create your own application with Facebook Developers to post your campaign, you need to prepare a picture that can be used as an icon for your app. This way, when the application requests the relevant permissions to users before they participate, the icon of your new application will be displayed. 4.2. Small icon for the application created with Facebook Developers. Even though it is not compulsory to upload the icon in a smaller size, we do recommend it so the icon stands out as much as possible on invitations or in any other place where it appears in a much smaller size.